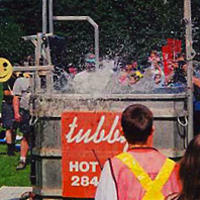 “The Tubby Dunker” is a custom made, LARGE aluminum Dunk Tank. 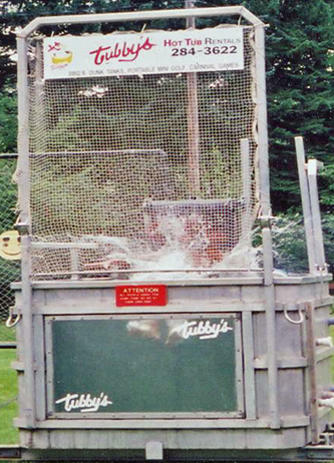 This Dunk Tank can accommodate a bigger, taller person than the “Easy Dunkers”. Clear window on the front, so you can see the Dunkee in the water. Capable of being heated to hot tub temperature, or just warmed to take the chill off the water. Water filtration, Chlorination and Heat also available for large events. Delivered on a trailer, placed on the ground. Location must be vehicle accessible. Dunk Tanks from Tubby’s Party & Event Rentals have been used to raise funds in the tens of thousands of dollars over the years for charity. Book a Dunk Tank from Tubby’s, the only company in Calgary to have multiple dunk tanks to fit most sizes and they all can be heated. Please contact the office and request specific information if required.